Samsung Mobile – This year Samsung was prepared to talk to about their product to end users who just want to complete a task as well as technical people like myself with specific tech needs and want to know what is under the hood. The Samsung booth at Blogher13 is miles away from the Blogher12 booth when I asked about the differences in two phone models and they didn’t have a person there who could answer my question and spoke to me on a superficial consumer level. Bravo! Daily’s Cocktails – Daily’s sponsored the BlogHer kickoff party but didn’t call it a day. Daily’s was smart to have a booth in the Expo Hall floor for those bloggers who couldn't make it to the party and/or wanted to speak to someone from the brand. The fun photo op encourages visitors to post the photos their social media channels complete with a trackable hashtag. Networking with a 10am margarita in hand didn't hurt either. Kiss USA – Kiss beauty products put a sample in BlogHer conference swag bag but did not let it do all of the talking. Kiss took appointments at their booth for a styling with their hair tools, and lessons how to apply their nail and false eyelash products while also finding out about the blogger and her community. Trojan Lubricants –To ensure that everyone who visited the Trojan booth only got their fair of product samples as well as a description of the brand and promoted item, visitors spun a prize wheel and answered trivia question to get samples and a product prize. This ensured quality interactions for both the brand and the blogger. La –Z-Boy – I was prepared to walk on this booth in the Expo Hall because while I like comfy, I’m generally not a fan of The Giant Chair. 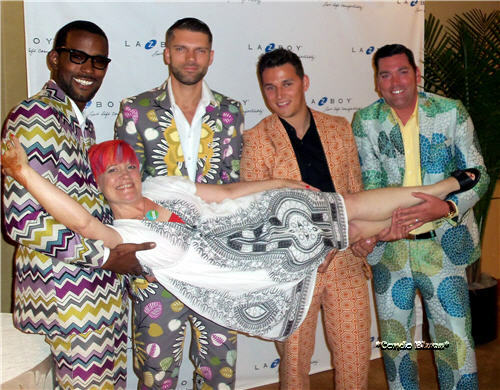 La –Z-Boy drew the crowd in and showed their fun side with photo ops with men dressed in suits made from their upholstery fabric. While I was there they convinced to sit in a chair that did not look like a Giant Chair recliner until they told me to lean back. A strategy that worked in demonstrating La –Z-Boy has furniture for the young and hip crowd too. Boom. A second brand photo in my conference stream invoking part of my brand – my rescue dog Lacey. I am the master of networking. A big high five to La –Z-Boy for being there for every blogger who wanted to meet with them. If you are fun or make me laugh, you win. CVS and Minute Clinic and Walgreens – I probably shouldn’t list competitors together but the feedback I got from fellow attendees is that both of those booths had people staffing them who asked attendees about their needs and their blogs. They didn’t just hand over a generous swag bag and be done with it. Both focused on quality interactions. Ryobi – I love that Ryobi Outdoor went to BlogHer to market their power tools to women for women, not for attendees to buy them for their husbands. The women staffing the booth were not only knowledgeable about the brand and product line, they didn’t talk down to me when discussing the product, DIY, or my projects (something that happens from time to time when I’m talking tools for my DIY blog Condo Blues.) They had someone monitoring their social media during the conference too. LOVE tool co is sponsoring #BlogHer13 promoting women DIYer use not as something to give spouse @Ryobioutdoors YOU ROCK! Land o’ Frost – Had a basic booth set up and offered product samples and coupons. Before you ho hum let me tell you what made Land O’ Frost one of the best booths in the Expo Hall - the attitude of the people in the booth. Land O’ Frost was the only brand who didn’t shut me down or refuse to talk to me when I politely turned down a dairy based sample due to my lactose intolerance. Not treating me like I am a leaper because I couldn’t eat a product sample got Land o’ Frost on front and center on my food blog and in social media community. The other brands? They missed out on the possible of reaching The Best Blog Community on the Internet – YOU. I'm not bitter or anything, just sad they chose to miss out. Feel free to leave a comment if you visited a brand at Blogher13 that wowed you and I may have left off my list.